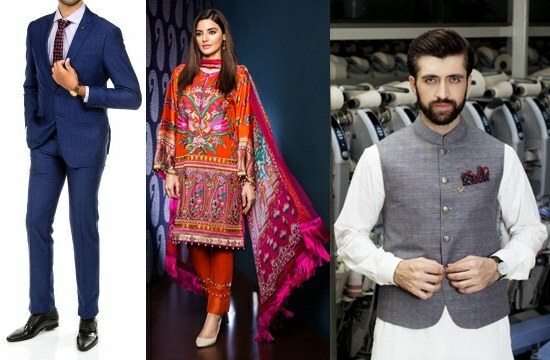 When you talk about buying ready made dresses or clothes and fabrics online in Pakistan, following are best brands which also have their online stores. We listed these stores without any priority because if one has huge variety, other has best quality; if one is famous among people, other offers affordable prices; if one has strong group on their back then other has good customer support, shipping and return policy. So it is a comprehensive list of clothing brands in Pakistan. Uniworth Shirt and Tie Shop is an old name in men's suiting. It sales men's piece and piece suits, men's blazers, sweaters, jackets, trousers, shalwar suits, kurtas, waistcoats, pajamas, night wear, track suit, t shirts, cuff links, belts, wallets, socks etc. They also have their outlets in various cities. It is a comparatively new name in ready to wear dresses but it has make its place among famous dress brands. You can buy online from a wide range of men, women and kids clothing. Bonanza offers formal clothing, knits and ethnic wear for men. While it has launched a separate brand for women, Bonanza Satrangi which offers women's pret, unstitched and accessories. It is also well known clothing brand. It was launched in 2008 but now it is one of the leading brand in casual and formal men's clothing. It is also a very reputable brand for ready made dresses for gents, ladies and kids. There are more than 60 outlets of Outfitters throughout Pakistan. It has huge collection of Men, Women and Kids western dresses. Khaadi is one of the most popular name in Men and Women dress collection, western and ethnic dresses for kids. Warda was founded in 2006 as a single store which has now many stores in major Pakistani cities. It has also its online store. It is also a women specific store which has huge fabric collection for ladies. Nishat Linen is a proud brand of Nishat Group. It also have an online store as well as physical stores across country. Its online store is a women specific as you can buy only dresses for women and baby girls. You can buy online unstitched, ready to wear, tops, lowers, tights, watches, bags, jewellery, footwear, bed sheets, bridal sets, comforters, cushions, curtains and lot more. It is a well known fabrics brand in Pakistan which has a vast range of stitched and un-stitched fabrics for men and women. They design and manufacture fabrics at their own factories. It is a stock exchange listed company with its own weaving and printing setup and about 60 outlets across Pakistan. At Ideas by Gul Ahmed, you will find a variety of fashion lines including pret wear, unstitched fabric (for males and females), polo shirts, formal and semi formal wear (for men), the diverse range of casual and formal wear (for women), chiffon, Chairman latha (for men), digital-print kurtis, accessories (shoes and handbags) and so much more. Bareeze is a renowned brand for unstitched ladies fabrics. It have varity of lawn, khaddar, karandi, cotton, linen, chiffon, velvet, net, organza and ladies shawls. It launches its winter, summer and eid collections. ChenOne has opened its stores in Pakistan and internationally. It is owned by Chenab Group. It has luxury collection of dresses. It is an online store with a lot of products at a very reasonable rates. As the name depicts, it has collection of export quality products which are made extra than the original order. Export Quality products can be purchased at a very reasonable rates. Daraz, most popular online store in Pakistan has also huge collection of ready to wear dresses and unstitched fabrics. It has huge collection with affordable prices.